iBird Yard+ Guide to Birds is the ultimate way to get started in birding. This inexpensive app has 242 different bird species including all the common birds found in backyard feeders in North America. Designed for the beginning birder, it is similar to iBird Plus Guide to Birds except that it does not have as many search attributes. It offers comprehensive identification, behavior, habitat and ecology information, hand-drawn illustrations, professional photographs, range maps, and playable calls for 242 North American backyard bird species. ★ iBird - The #1 most trusted field guide app for birders. ★ ▶ iBIRD YARD PLUS VERSION 7.22 UPDATE SALE - 40% OFF SALE ENDS SOON, SO ACT NOW. PRICE REDUCED TO $2.99 ▶ INCLUDES 242 Species. 149 Common Backyard birds and 93 most common non-backyard birds of North America found in backyards. ▶ MWG’s GREATEST UPDATE EVER! We’ve added new species to iBird’s database aligned with the AOU / ABA standards, optimized for iPhone 5 and 6, iOS 7 and 8 & iPad Mini and added many new drawings and photos. 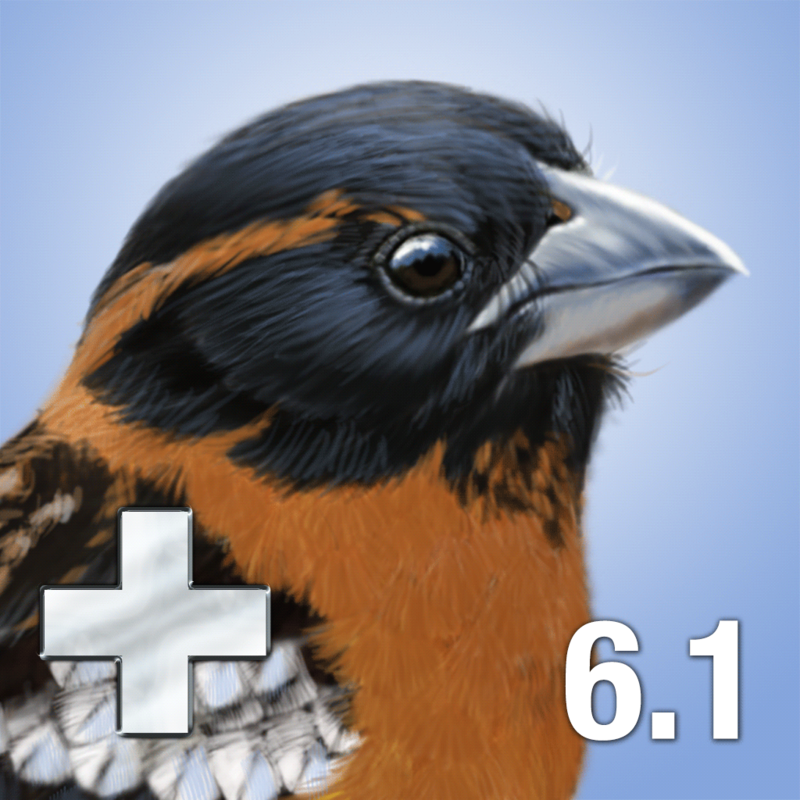 ▶ IPHONE 5 and 6 SCREEN SUPPORT - iBird now takes full advantage of the taller iPhone 5 and 6 screens. ▶ FULL SCREEN & LANDSCAPE VIEW FOR ILLUSTRATIONS – with zoom and pinch. ▶ CHECK THIS IBIRD PRODUCT COMPARE TABLE: http://tinyurl.com/ibird-products iBird is the app everyone has seen in Apple’s TV commercial “We have an app for that” (see ibird.com/itchy) and has become the world’s best-selling birding app. It comes with a powerful decision engine for identifying any bird species of North America just like an expert. iBird replaces all your heavy field guides with a portable database that doesn’t need a connection to the internet like some birding apps. ▶ BUYER’S GUIDE TO BIRDING APPS – Before you buy any bird app compare their features at: ibird.com/compare. ▶ SYNCS – Automatically syncs Favorites and Notes to iCloud. ▶ 18 SEARCH ATTRIBUTES – search by color, shape, song, location, head and body patterns, flight style and much more. Includes a new way to search by color, tutorials on how to use the search and definitions of every attribute. ▶ AUDIO SONGS AND CALLS – iBird Yard + Guide to Birds offers 2.1 hours of bird songs and calls. ▶ UNIQUE SPECTROGRAPHIC DISPLAY brings insight to the structure of bird songs by allowing you to view the sound's frequency components. ▶ PHOTO CENTER - Photo Center is a gallery for storing and assigning your photos to specific species pages in iBird. It also allows you to share photos via Facebook and Twitter, or email them to friends. AWARDS and ACCOLADES for iBird: ■ MACWORLD'S "BEST REFERENCE APP 2009: 4 ½ out of 5 mice." ■ O'REILLY "BEST IPHONE BIRDWATCHING APP 2009" ■ NOMINATED 2012 BEST APP EVER FROM 148APPS.COM ■ RECOMMENED BY SCIENTIFIC AMERICAN MAGAZINE, AUGUST 2012 ■ TELEVISION PERSONALITY HOST PHIL DONAHUE'S FAVORITE BIRD APP Standard Features: ■ Parameter driven search engine lets you identify birds quickly, so you spend more time observing and less time reading. ■ Search by Shape, Size, Habitat, Color, Family, Song, Length, Weight, Flight Pattern, Wingspan, and much more. ■ Taxonomic and Alphabetical Family sort options. ■ Hand-drawn full sized color illustrations, with perching and flight views. ■ Multiple professional photographs for each species showing sexes and seasons. ■ Extensive identification, behavior, and habitat information. ■ Full color range maps. ■ Bookmark birds as Favorites for fast access. ■ Date and time stamped Notes for every species account. As a standalone iPhone app, iBird does not require an Internet connection for access to the information in its database. This does mean that the application is large, so please be patient when downloading from iTunes. ▶ iBIRD YARD PLUS VERSION 9.2 UPDATE SALE - 40% OFF SALE ENDS SOON, SO ACT NOW. PRICE REDUCED TO $2.99 ▶ MWG’s GREATEST UPDATE EVER! We’ve added new species to iBird’s database aligned with the AOU / ABA standards, optimized for iPhone 5 and 6, iOS 7 and 8 & iPad Mini and added many new drawings and photos. ▶ IPHONE 5 and 6 SCREEN SUPPORT - iBird now takes full advantage of the taller iPhone 5 and 6 screens. ▶ UPDATED ILLUSTRATIONS - 28 iBird species have brand new illustrations by one of our award-winning artists, Michael Oberhofer. ▶ FULLSCREEN VIEW OF ILLUSTRATIONS - Now by tapping on the illustration for a species you can open a full screen view of the illustration that allows you to zoom. ▶ LANDSCAPE MODE - All of the iBird portrait screens now support landscape orientation on the iPad and the iPad Mini. ▶ IPAD FULL LANDSCAPE MODE – All screens on iPad now work in Landscape. ▶ UPDATED SPECIES NAMES - Updated the common names of several species, and some species have had their Latin names revised. We made changes to the taxonomic ordering and band codes for all the species with new Latin names. ▶ MISCELLANEOUS – Syncing of Favorites and Notes is now to Dropbox and is automatically backed up when internet is available. Location search has two attributes: Common for the most popular species in a state and Uncommon for rare and state listed birds. Attributes are grouped into basic, head and flight related area. 14 new search attributes including search by patterns, length, wingspan. Updated state and province bird lists using official references. Shake your device to automatically play a random bird song. Taxonomic and Alphabetical family sort options on Browse screen. Easy! ★★★★★ This makes it easy for even a novice bird-watcher to identify birds. I enjoy the bird songs as well. As a standalone app, iBird does not require an Internet connection for access to the rich media information in its database. This does mean that the application is large, so please be patient when downloading. You can also keep up to date with fellow iBird users by following @iBirdExplorer on Twitter and by joining the iBird fan page on Facebook. If you use iBird in the field, please do so responsibly. We recommend the American Birding Association's Code of Ethics (http://www.aba.org/about/ethics.html), particularly section 1(b), for guidance.